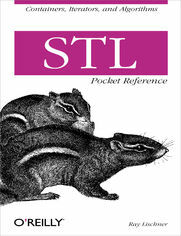 The STL Pocket Reference describes the functions, classes, and templates in that part of the C++ standard library often referred to as the Standard Template Library (STL). The STL encompasses containers, iterators, algorithms, and function objects, which collectively represent one of the most important and widely used subsets of standard library functionality.The C++ standard library, even the subset known as the STL, is vast. It's next to impossible to work with the STL without some sort of reference at your side to remind you of template parameters, function invocations, return types--indeed, the entire myriad of details you need to know in order to use the STL effectively and get work done. You need a memory-aid.Books that cover the standard library and the STL tend to be quite heavy and large, describing each aspect of the STL in detail. Such books are great when you're not familiar with the library, but get in the way when you simply need to remind yourself of a function name, or the order in which you pass arguments to a function. Programmers familiar with the STL need a small, lightweight memory-aid. That's what the STL Pocket Reference is. It's small, lightweight, and chock-full of information that you can take in at a glance, so you can get on with your work.